← Fraudulent ebay sellers infuriate me. Samsung dart screenshot how to. I couldnt figure out how this was happening, until today. 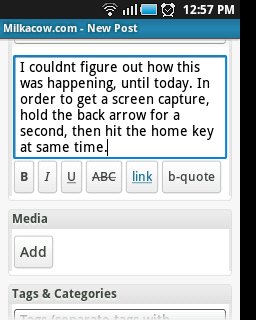 In order to get a screen capture, hold the back arrow for a second, then hit the home key at same time. This entry was posted in Uncategorized and tagged Android samsung dart screenshot scrren capture. Bookmark the permalink. 11 Responses to Samsung dart screenshot how to. Very very helpful THANK YOU. Thank you milkacow. Success the 1st time. into position over the” back “and “home”. i tried it and it doesn’t work. it just shows my task manager. You are a life saver!! Thank you soo much!!!! It finally works!!!! Arrow + home button!!! Woah, great thanks. I have dozens of shots but could never figure out how a did it. I even checked online but everyone always had to download something.